Fans and air handling equipment represent a large and important segment of building systems design. There are a few important principles which are very useful and easy to remember when approaching a fan problem. This article outlines a few of those considerations. 4. Plug fan -essentially a centrifugal fan without a housing used to circulate rather than transport air. 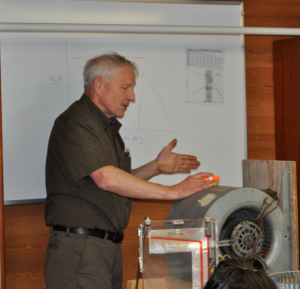 A more detailed analysis of the fan laws can be found in chapter 21 of the ASHRAE Manual. If you want to increase CFM by 10% you need to increase horsepower by 33%. In other words, it is always easier to slow down a fan than to increase the volume. 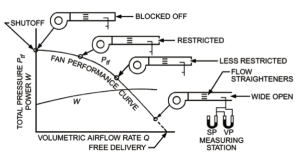 By moderately over-sizing a fan, the engineer gains performance flexibility little or no efficiency loss. 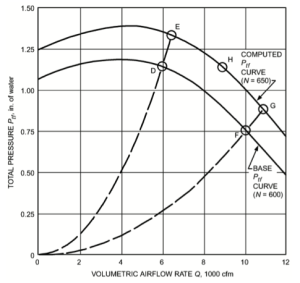 From the 2012 ASHREA Manual, a typical fan curve. 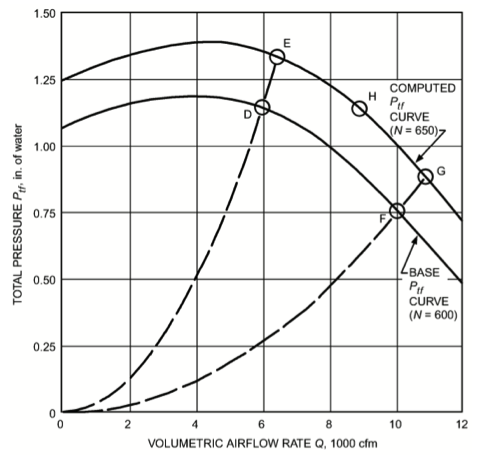 Performing tests of certain fan configurations creates the Fan curve. From The ASHREA Manual, this is demonstrated by the following drawing. A standard fan is started at maximum pressure and slowly opened to maximum flow rate. When Generalized a typical fan curve looks like this where the dashed lines represent efficiency of the fan. 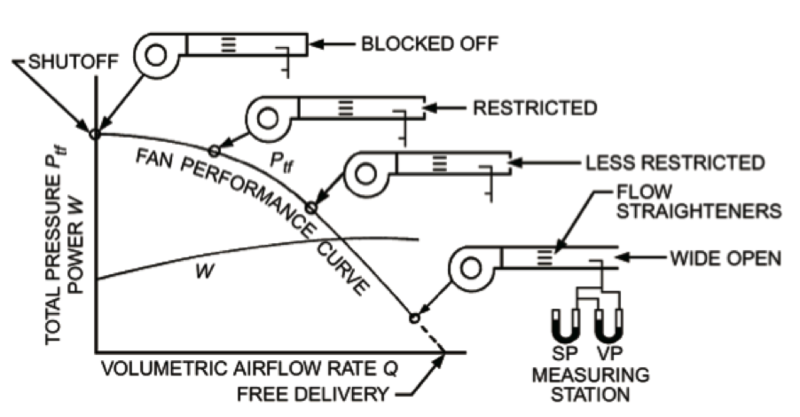 The main thing to remember is never design a fan in the performance envelope outboard of the two dashed lines as efficiency and performance will suffer in practice. It is important to pay attention to the flow characteristics downstream of the fan outlet. It is best to try and emulate the conditions of the test/reference fan where possible; straight flow for as long a length as practical. This allows the flow to organize before taking a bend or a branch. This entry was posted in Uncategorized on April 28, 2014 by Dan Robles.